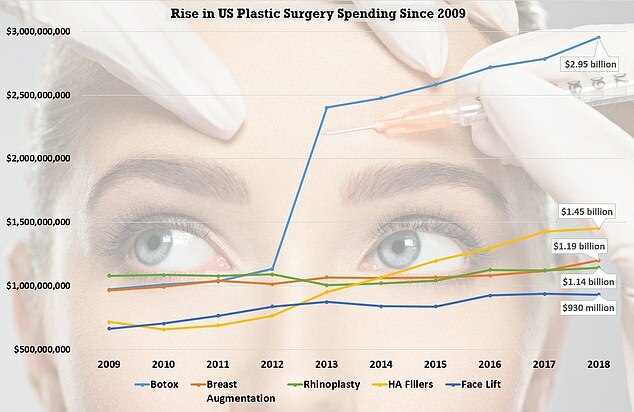 Americans spent more than $16.5 billion on cosmetic plastic surgery and fillers in 2018 – up four percent from last year, a new report reveals. The rise in spending is driven by both soaring demand and climbing rates – a trend which analysts do not expect to wane any time soon. But that isn’t slowing customers down. ‘Cost is always a consideration when considering an elective surgery,’ said Alan Matarasso, MD, president of the American Society of Plastic Surgeons. ‘However, the least expensive procedure is the one done correctly the first time. ‘When considering a procedure, ask your friends and family, review before and after pictures and take the time to consult with more than one board-certified ASPS member.